Check-in conversations between managers and direct reports are common sense. Don’t over-engineer them — just have them. We’ve long known the power of conversation — especially positive conversation. As humans, we crave attention, and conversations are one of the primary attention vehicles. This is true throughout all aspects of our lives, including our work lives. You might be thinking, ‘I talk to people every day at work, sometimes all day.’ These conversations don’t seem very life-changing. They’re not. A specific kind of conversation is what we crave, the kind that will move the needle on employee engagement. It’s important to define what we mean by employee engagement. Here, it is a metric to measure the precursors to productive behavior, which is the precursor to extraordinary performance. The Marcus Buckingham Company, an ADP Company, measured the impact on a direct report’s engagement when managers connected with direct reports. In other words, we measured how managers paying attention to their direct reports about near-term future work (through a strengths-based lens) made a difference in how employees behaved and performed. Employees who frequently responded to the check-in items were more engaged. 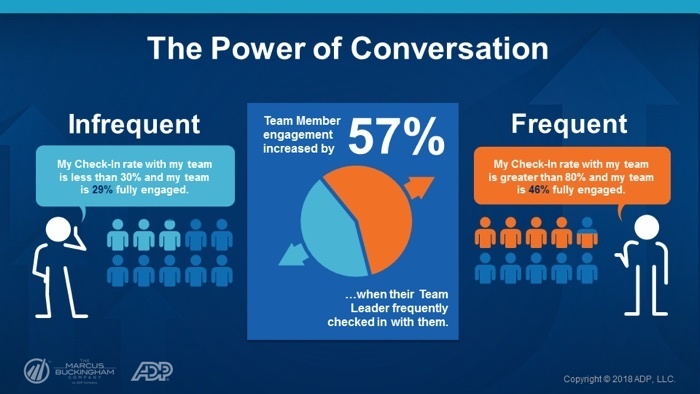 Here’s the amazing discovery: When managers connected with their direct reports about that direct report’s check-in, the employee’s engagement was amplified even more. Weekly conversations amplified employee engagement by 60 percent in a retail organization, 57 percent in a tech organization and 54 percent in a healthcare organization. We’re not talking marginal changes here. Organizations where managers and employees are having intentional check-ins every week feel different. Employees are more likely to feel they will be recognized for excellent work, more confident in their opportunities for career challenges, more aligned to organization’s future and more likely to use their strengths. In other words, employees who have weekly check-in conversations with their manager do more, and they perform better.